the first to complete a clean sweep of all the BVI Schools Ruby Festival divisions, when they upset defending champs Elmore Stoutt 5-2, in the U15 Division on Friday, at the E. Walwyn Brewley Softball Park. 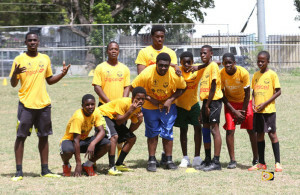 Last week, Seventh Day shutdown new comers Virgin Islands School of Technical Studies 2-0, in the U17 Touch Rugby Division, after their Primary School team overpowered Ebenezer Thomas 2-1, in the Tag Ruby Class. Cedar School and St. Georges also participated in the Schools Rugby Festival. Solomon said Seventh Day’s victories didn’t come as a surprise because they started an afterschool program with him last year and a number of students have been showing interest. He added the during the week he also has classes with them in school. For the last six years, Solomon who has been running the school program said in past, he saw teams running and pausing. Now however, he’s seeing teams planning strategy, they’re supporting, attacking and are more organized going forward as a group, instead of players running and missing tackles. The BVI is gearing up to compete in a rugby tournament in St. Thomas later this month.